Part of The Grand River Folk Community! Welcome to the Old Chestnuts Song Circle! We are an informal group of people who like to sing. We meet every month (September - May) in a home in Kitchener, Ontario to sing together, and have been doing so since 1995. We also present concerts and workshops (via Folk night at the Registry), and help put on the neighbourhood Chequegnat Festival. You can read more about us on Facebook , and learn about our history by sampling our newsletters (see below). This site is rarely updated these days. New singers are always welcome. If you'd like to sing with us, please drop me a line and plan to come join the Circle next time we meet. We begin our TWENTY-FIRST season on September 26, 2015. Please contact Jack for more information. . Folk Night at the Registry! the Folk Night page and follow The Registry link for information about season 10! 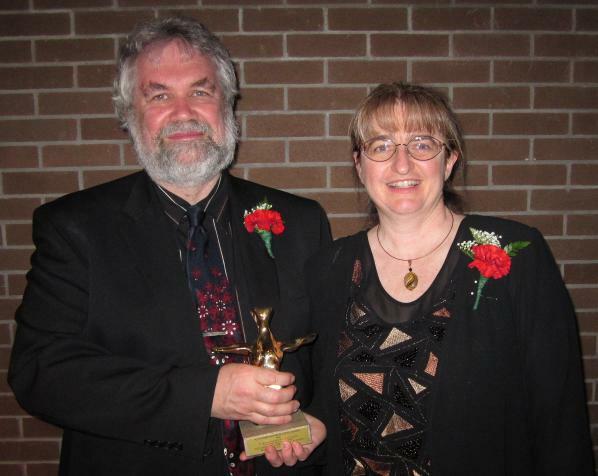 June 6/10: The Old Chestnuts Present Folk Night at the Registry wins a KW Arts Award!! Jack and Lori Cole accept the KW Arts Award for Community Event. Song circles are the fourth Saturday of most months! For example - September 26, 2015, but sometimes it changes. Always check! Call 519-578-6298 or email jhcole@mgl.ca for information. Jan 08. Welcome to season 13! January 07. Just a plug for concerts! February 06. * The Merrick Jarrett Memorial Song Circle * Pomelos Coming! October 05. * Octoberfolk 2005 * Pied Pumkin is Coming! October 03. * Mill Race 2003 Report * Octoberfolk 2003 Report * New Season! May 96, April 96, February 96, January 96, December 95, November 95, September 95. For more information about Kitchener Ontario's Old Chestnuts Song Circle, Folk Night, and the Grand River Folk Community call Jack at 519-578-6298 or email jhcole.